Islanders coach has been calling out the names of his two 24-year-old defensemen easily and often during the team's 2-1 start. 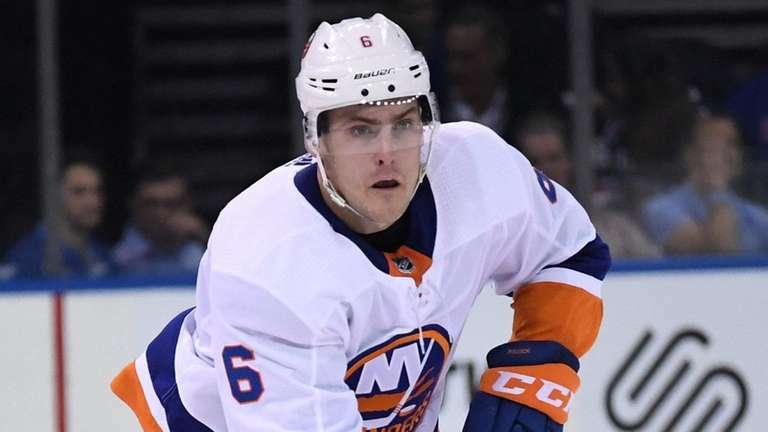 The Islanders’ emerging top defensive pairing of Ryan Pulock and Adam Pelech figures to present a challenge all season for TV and radio broadcasters because of their alliterative and similar surnames. It’s much like when the team employed Mark Streit and Brian Strait together on the blueline a few years ago, or when Brock Nelson, Frans Nielsen and Anders Nilsson all were on the roster concurrently. But new coach Barry Trotz has been calling out the names of his two 24-year-old defensemen easily and often throughout the team’s 2-1-0 start. 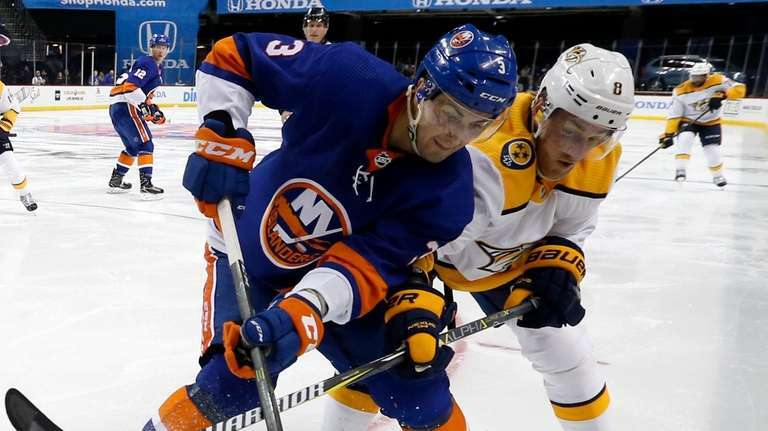 Trotz indicated on Wednesday that he plans to continue to employ the duo for heavy and significant minutes when the Isles begin a four-game road trip on Saturday in Nashville. “I think both of them are growing as sort of really good, solid players,” Trotz said after Wednesday's practice. “I’m gonna play them and they’re not scared. They’re gonna make some mistakes, but I want them to feel comfortable that they know they’re good players. Pulock, the Isles’ first-round pick (15th overall) in 2013, finally established himself as a regular contributor and offensive threat last year with 10 goals and 32 points in 68 games. Pelech, the team’s third-round selection in 2012, is more of a stay-at-home defender who went 3-16-19 with a plus-7 rating in 2017-18 in a career-best 78 appearances. Nick Leddy led the Islanders in ice time last season at 22:14 per game, but he finished with an NHL-worst plus/minus rating of -42. Notes & quotes: Czech center Jan Kovar, a free-agent signing out of the Kontinental Hockey League (one year, $2 million), was placed on unconditional waivers. Kovar didn’t report to AHL Bridgeport after failing to make the Isles’ roster out of training camp . . . Veteran winger Andrew Ladd (upper-body injury) skated alongside Valtteri Filppula and Leo Komarov on Wednesday and “definitely will go on the road trip,” according to Trotz. But the coach wouldn’t commit to Ladd making his season debut Saturday in Nashville. “He’s still day-to-day . . . I think he’s at the point where we’ve got a couple more days (of practice) and we’ll have to decide what we’re going to do at that point. We’ll see how he does the next couple days and we’ll make our decision. Is he in or do you wait another game or two?” Trotz said.